First, introduce the world to Vesperian Sorrow. We are a melodic, atmospheric metal band from central Texas. We are indeed influenced by several European metal bands, as well as other forms of obscure music. We tend to feel that our style is of a purgatorial quality, as it can not be likened to just one niche or style in this music genre. At times our music represents sheer power and aggression, then to be reciprocated by melancholic moments of sheer beauty. We have more or less chosen to devote our lives to this commitment that we have imposed upon ourselves. To create the best art through music that we possibly can. We have a promo here, 'Beyond the Cursed Eclipse,' tell us about this release. It is our first full-length release. The album will be released through Displeased Records, out of Holland. The promos are more so to achieve recognition, and establish a following in the music community. The actual finalized product will be released very soon, fall of this year actually. The material herein is a culmination or our perseverance, and desire to bring forth what we have been enjoying composing and arranging for some time now. We hope it will be accepted by many. Can you define to us the meaning behind your band name? We consider ourselves to be somewhat tenebrous and somber individuals. Our true lives ultimately thrive during a period of existence in which it is absent of light. Hence we gather a sense of togetherness during the vesper hours. Sadness or sorrow is something that we all experience and endure until we can overcome this emotion. Strength is derived from surmounting certain dismal points in ones life. Therefore we feel the words Vesperian Sorrow are an interesting reflection about what we as musicians and individuals perceive through life and artistic expression. What sort of things does Vesperian Sorrow represent? We present to everyone how we are in everyday life. We choose not to necessarily influence others, so much as we do ourselves. Interpretation of us through others is solely derived from what those perceive. Representation is as it will be. We do feel that Vesperian Sorrow exudes honesty and integrity, as there are no false pretenses present in our lives or music. Since I have no lyrics here, explain to us what your lyrics are based upon. Actually, the lyrics are arranged mostly from my own thoughts and imagination. As not to dwell on topics and themes commonly featured in this form of music. I create my own stories as I envision settings and situations in my own mind. Comprehension may not be readily prevalent for those who can not converse with the author and understand what was being put to words as these images were formed. I find great beauty in many things that others would embrace with abhorrence. The wretched, gloomy side of nature has influenced myself greatly. I hold a fascination with obscurity and solace which I bring forth in text to music. What sort of things (outside of music) inspire you to create music? We derive our music through our own moods and feelings at the times we are creating our arrangements. We all possess our own lives and endure different situations as we move along. We gather together and create from these differences certain elements of diversity. Our music is more or less felt from within our own selves. I don't imagine too many people have yet to hear Vesperian Sorrow, so, for those unknowing, explain what makes Vesperian Sorrow worth investigating further. We feel that we possess an original quality not too common these days. We do not really consider ourselves to be solely black metal or death metal. It is more of a culmination of several different genres, along with our own unique writing style. We feel that any listener of extreme music, would gather some fulfillment from this band. To the more philosophical side of things... tell us what you absolutely hate most of existence. And, in contrast, what makes this life worth living to you? Hatred is my strongest emotion. I care not to exhaust it on infantile happenings that do not involve myself. Yes, certain things do bother and frustrate individuals, but one should not linger on such moments. I feel that it is a waste of existence. Transform all hatred into something that can be honored, such as strength or courage. If we as individuals constantly went through life hating, then there would really exist nothing worth living for. Music, art, the people I have chosen to embrace, I want to survive for. Tell us about your religious/spiritual beliefs...? Religion to myself is non-existent. I feel that every individual has a right to believe in whatever it is that they choose. It is a very personable quality. There are many organized religions present today. If a person chooses to commit themselves to such an act, then I feel it has absolutely no relevance to anyone else. There has always been, and always will be great debate if there exists a God, or an Anti-God for that matter. I feel that no one person can make this determination for all people. Choose what you want to choose. Do what you want to do. As far as my beliefs- I choose to worship myself. My body is my temple, and my mind is the altar at which I gather. What do you envision when you contemplate death? Is there a preferred way you'd like to leave this world? I have to honestly say that I have absolutely no idea of what death will be like. As much as I contemplate life, and how much I enjoy being alive, I contemplate death just as well. I hypothesize it because there is a sense of unknowing. A great vast void that I know I will embrace one day. We all struggle to keep ourselves alive, knowing that one day we will become expired. Sometimes I wonder what it is all for. While I am in existence, I want to fulfill my life to it's fullest extent. When I do leave this world, it will be something that I revel in. I would say to my executioners that by killing me, it will only make me stronger, and more pertinent than they will ever be. Through my death, another shall obtain life. To kill someone through execution is an act of weakness. There is no challenge in such a cowardice action. I can not express what I would envision before death. Only the time of such a situation could yield such thoughts. If you were granted the answer to any one question, what would the question be? What shall occur when my life comes to an end? Its no secret, the world is in social/natural decline, to say lightly. Tell us your thoughts on this world... and do you see hope for a brighter tomorrow? The conditions of this world are of no concern to me. I have chosen to create and exist in a world of my own likening. I have always felt that society has disassociated itself with me. Therefore I have chosen to disassociate myself with society. My immediate surroundings with what I have bestowed upon myself, are what matter to me. A persons existence is what they make it. The world is as the world has been formed. This planet we live upon holds us with contemptuous mirth. We will all be terminated from this world, and this planet will still remain for countless eons. How do you see the world 100 years from now? In a centuries time, I will have been long gone from this world. It may be here and be more prosperous, or it may very well no longer be in existence. I don't know. What sort of literature interests you, if any? The only literature that I have ever been interested in is the poetic scriptures of English poet Algeron Charles Swinburne. The man was truly miraculous. I happened across his work a few years back, and have since been fascinated with his usage of words. Would you say Vesperian Sorrow is one of those politically correct bands? Tell us what you think of such types. No, I would say that we are not a politically correct band. Those particular topics are not conducive with what we are interested in. Those types that choose to express themselves that way, we can appreciate. They are doing what they want to do and that is adherent with us. I feel that I am as mighty as I only can allow myself to be. My methods of living, and what I have chosen are what is right for me. Weakness can only occur if someone allows it to happen. One must reach inside of their own feelings and continually stay strong. And to end with a few music oriented questions... Tell us what we can expect for the future of V.S.? We shall continue to be what our lifestyles have chosen for us to be. Musicians. All of us have accepted that this is our way of life, and until that life is taken away, we shall continue to strive to be the best musicians and artists that we possibly can be. 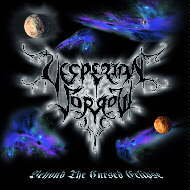 Vesperain Sorrow will undoubtedly remain here for quite some time to come. Our dedication will not allow this project to come to an end any time in the near future. Expect from us many more albums, and perhaps other creations of artistic expressions. How can those interested obtain your work(s)? All those interested can obtain our work through myself, or through Displeased Records. There are also many distros that will be carrying what we have produced. I would truly like to express gratitude to all the ones who have supported this scene. It is a constant struggle, but with what is brought forth, it makes it all worth it. Not to be said with arrogance, but I feel that I am a wise human being, but my knowledge can not be any greater or any less than that of someone who possesses their own wisdom. A person can teach another, although he can not make them learn. Be true to yourself and those you respect. Keep the struggle alive, within the music community, and within your own existence. See you all very soon, in this life or the next.